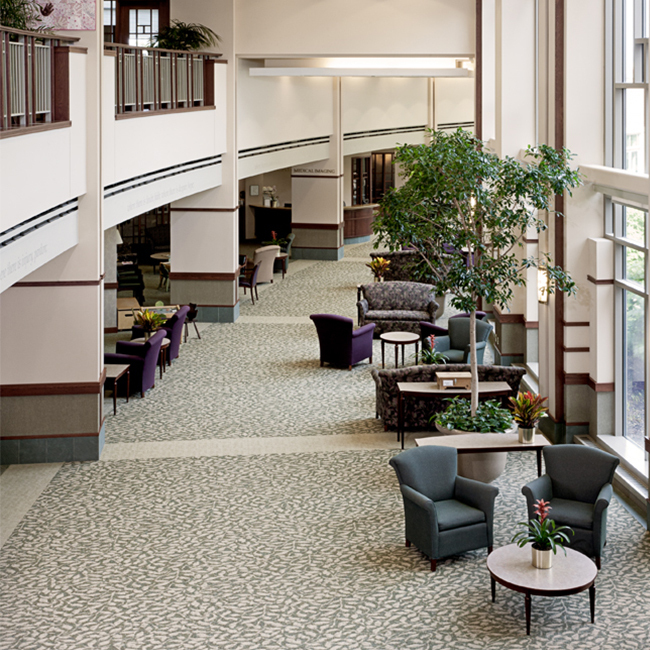 OSF HealthCare, owned and operated by The Sisters of the Third Order of St. Francis in Peoria, Illinois, includes the OSF Healthcare System consisting of eight hospitals and medical centers, one long-term care facility, and two colleges of nursing. The OSF Center for Health – Route 91 was the first outpatient care center of its kind in the Peoria area. The design group’s challenge was to maintain the original design intent of the building. This required the selected carpet tying in with the existing colors/patterns of wall coverings, fabrics, etc. – without it looking like it was not part of the original project. A combination of Romanesque, Maché, and Palladian modular carpet offered a fresh solution that worked well with the existing broadloom carpeting. TheRomanesque pattern beautifully tied in with the natural theme of the building while the color Embellish accented the warm feeling of the environment. Machéand Palladian were good coordinates to break up some of the open spaces where definition was needed. Overall, everyone was very pleased with the end results of the carpet replacement. The installation went very smoothly with little disruption to business. Design Firm – OSF Design Group, Inc.